Prominent northerners yesterday lashed out at President Goodluck Jonathan for accusing President-elect Muhammadu Buhari of running a parallel government following the outcome of the March 28 election. The Federal Executive Council,rising from its meeting on Wednesday, had said the Jonathan Administration was not comfortable with some terms of reference of the incoming government’s transition committee which tend to create a parallel government. But reacting to the government’s position yesterday, the Chairman of the apex northern socio-cultural organisation, Arewa Consultative Forum (ACF), Alhaji Ibrahim Coomassie, said there was nothing wrong in Buhari’s approach and that the government itself had been making some questionable appointments at the twilight of its tenure. In less than a month from now, Nigerians will usher in a new government. As an elder states¬man, what is your advice to the incoming admin¬istration? As everybody knows, the main agenda of the new admin¬istration is to fight corruption, to deal with the security sit-uation, particularly the Boko Haram insurgency, rescue the Chibok girls and deal with unemployment. These are the priority areas in terms of their policy objectives. It is, there¬fore, the expectation of every Nigerian that these three issues would be the main areas of their attention. I think that after taking over power, these areas would be the yardstick by which the people would pass judgment on them. I think that after the first six months or thereabouts, Nigerians would be in a position to judge whether the new administration would be in a position to fulfill the promises they made to the public or not. George Akume, Senate Minority Leader has stated that he is not interested in succeeding David Mark as Senate President of the 8th Assembly. Akume has also denied having a meeting with a national leader of the All Progressives Congress, Bola Tinubu, over his purported ambition. He stated that he never had is eyes on the senate presidency or any position at the moment, as he was busy attending to pressing national issues. In a statement by his media aide, Beckie Orpin, the former governor of Benue state said there was no meeting between himself and Tinubu on Tuesday, rather he attended the 8th National Assembly retreat and later held meetings with his colleagues in Abuja. “For the avoidance of doubt, Senator Akume along with other senators-elect received the president-elect, Muhammadu Buhari, at the ongoing 8th National Assembly retreat at the International Conference Centre, Abuja in the morning of April 29. 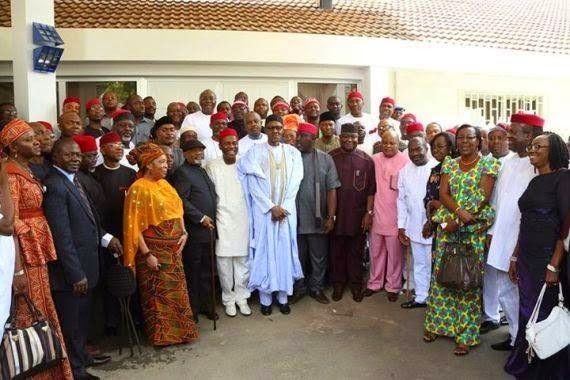 Some Igbo leaders including retired Army Generals and the former President General of Ohane¬ze Ndigbo, Dr Dozie Ikedife have paid a private visit to the President-elect, Gen¬eral Muhammadu Buhari to make a case for the Igbo in the incoming APC-led feder¬al government so that the re¬gion will not be abandoned for not giving massive sup¬port to the victorious party like the South West during the just concluded presiden¬tial election. Dr Ikedife who disclosed this at his Nnewi residence, yesterday, said the purpose of the visit was to appeal to General Buhari not to leave the Igbo in the cold in his ap¬pointments and infrastructural development because of the low support he received from the South East geo-political zone during the presidential election. “You know people of the South East voted heavily for the PDP and not very much for the APC. And I had always warned during the campaigns that the Igbo should not put all their eggs in one basket. And the impression will be that the President-elect was not sup¬ported by the people of the South East. Our visit is to let the President-elect know that he is the President for all and that he has to accommodate people from the South East in his administration. 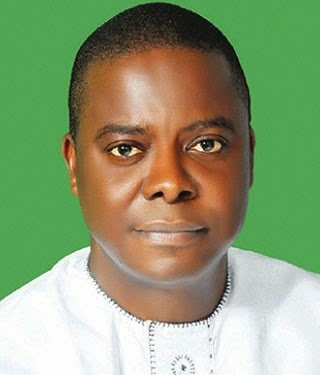 A major crisis has hit the All Progressives Congress in Enugu State after report emerged on Friday that the APC National Vice-Chairman, South-East, Mr. Emma Eneukwu, allegedly slapped the party’s governorship candidate, Mr. Okey Ezea, following an argument over ministerial slot in the forthcoming Muhammadu Buhari-led administration.The alleged incident happened on Thursday during a meeting of South-East APC leaders at the Imo State Governor’s Lodge in Abuja. It was gathered that the closed-door meeting was chaired by Imo State Governor, Rochas Okorocha, and had Senator Chris Ngige, Senator Osita Izunaso, Gen. J. O. J. Okoloagu (retd. ), and others in attendance. Ezea disclosed the development in a text message that was forwarded to journalists in Enugu on Friday. Embattled National Chairman of the Peoples Democratic Party, Alhaji Adamu Mu’azu, has said the culture of use and dump must stop in the party. He said rather than trade blame among party members over the result of the 2015 presidential election, the party should see the outcome as an opportunity to reinvent itself and retake power in 2019. Mu’azu stated this in a statement in Abuja on Saturday. The PDP chairman has come under intense pressure to resign following the disastrous outing of the party in the last general elections. Governors of the party at their meeting, which was also attended by Mu’azu and two other members of the National Working Committee in Abuja on Wednesday, demanded the resignation of the NWC members. The governors were said to have argued that it was better for the NWC members to leave and allow fresh hands run the affairs of the party. Mu’azu, however, said instead of wasting time, energy and resort to blame game over the party’s failed bid to win the presidential election, the party must move ahead. He said, “The result of the 2015 presidential election is the elixir the PDP needs to reinvent itself and retake power in 2019 instead of wasting time, energy and resorting to mudslinging and blame game over the party’s failed bid to win a fourth consecutive presidential election victory. “Stories spreading like wild fire in the social media about schisms in our party can only energise the incoming administration of the All Progressives Congress and their wish list that include the burial of the PDP. Leaders of the South East delegations of the All Progressives Congress ( APC) have made a special appeal to the President-elect, Muhammadu Buhari to consider the region for the position of the Secretary to the Government of the Federation while choosing members of his cabinet.Speaking on behalf of the delegation, Imo State governor, Rochas Okorocha said although the region could not be delivered to Buhari in the presidential election, they were able to cutdown the damages over 7.2million votes the PDP had projected to get from the region. “We (South East APC) are more victorious than you are on your victory at the presidential election, many of us would have gone on exile if you had lost. Although we could not deliver the south east to you, what we were able to do however was to cutdown the damages 7.2million votes the PDP had projected to get from the southeast. Okorocha said.While expressing hope that Buhari’s government will be successful and as well support the cause of the Southeast, Okorocha appealed that the region should be considered for the position of the Secretary to the Government of the Federation. Former Vice President Atiku Abubakar over the weekend commenced lobby for the candidacy of Nigeria’s Minister of Agriculture, Akinwumi Adesina as President of the African Development Bank (AfDB). A statement issued by the Atiku Media Office in Abuja said that Atiku Abubakar’s shuttle diplomacy to shore up the much-needed support for the Nigerian candidate follows a mandate from President-elect MuhammaduBuhari to the former Vice President to leverage on his contacts to lobby for the emergence of Mr. Adesina. President-elect Buhari, who backs the candidacy of Mr. Adesina, had last month conveyed his support to the President of Ghana, John Mahama, when the two leaders met in Abuja. According to the statement, Atiku travelled with Mr. Adesina to South Africa over the weekend where the two met with President Zuma at the Presidential Residence in Durban. Barely four days after he vowed to probe the Nigerian National Petroleum Corperation, NNPC, over the missing $20bn, the president-elect, Mohammadu Buhari has said that his government would not spare any security personnel found guilty of electoral offences in the last general elections. Making particular reference to Edo, Imo and Rivers States, Buhari said that he had already instructed the affected governors to document all offences alleged to have been perpetrated by the personnel. According to him, those to be prosecuted cuts across the Nigerian Army, Police, Department of State Security Service, DSS and other paramilitary organisations. Buhari disclosed this when he received in audience members of the South East Caucus of the All Progressives Congress, APC who were at the Defence House in Abuja to congratulate him on his electoral victory. THE President- elect, General Muhammadu Buhari yesterday painted a gloomy picture in the economic development of his administration as he said that the decline in the revenues due to fall in oil prices poses a great threat to his administration’s development agenda. Gen. Buhari who visited the newly elected Senators and House of Representatives members who are undergoing induction course in preparation for the 8th National Assembly in Abuja also said that the decline in revenue would affect the reconstruction of devastated areas in the country as a result of insurgency. The 2015 Presidential elections came with a shocker for many. PDP came to realize that so many who feigned loyalty to the party and president Goodluck Jonathan were actually not true to their creeds. 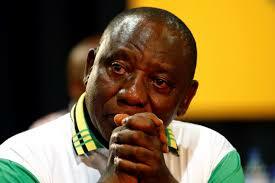 But among many stood a man of his words, who stood by the president to the very end. That man is Dr. Patrick Ifeanyi Ubah, the national coordinator of Transformation Ambassadors of Nigeria (TAN). He single handedly pulled his resources to campaign for the president via TAN. If Nigerians know any achievements of President Jonathan today it is because Ifeanyi Ubah via TAN publicized them. He converted his multi-million naira property in Abuja into an office, employed professionals to champion the campaign activities of the President. Irrespective of his wealth and status, he worked with his team 24/7 to see that the president was re elected. The TAN Abuja office became the centre of the president’s campaign with rallies, TV ads, Social Media campaigns organized and funded by TAN on daily basis. What many may not know is the fact that Dr. Ifeanyi Ubah was the sole financier of TAN without any support from the president. President Goodluck Jonathan made this known himself during his address on the launch of the PDP Volunteer Scheme at the state house Abuja on the 14th of March, 2015. Considering the recent exodus of some People Democratic Party (PDP) loyalists decamping to the leading opposition party All Progressive Congress (APC), President Goodluck Jonathan has urged them to remain in the party to build a stronger democratic environment. 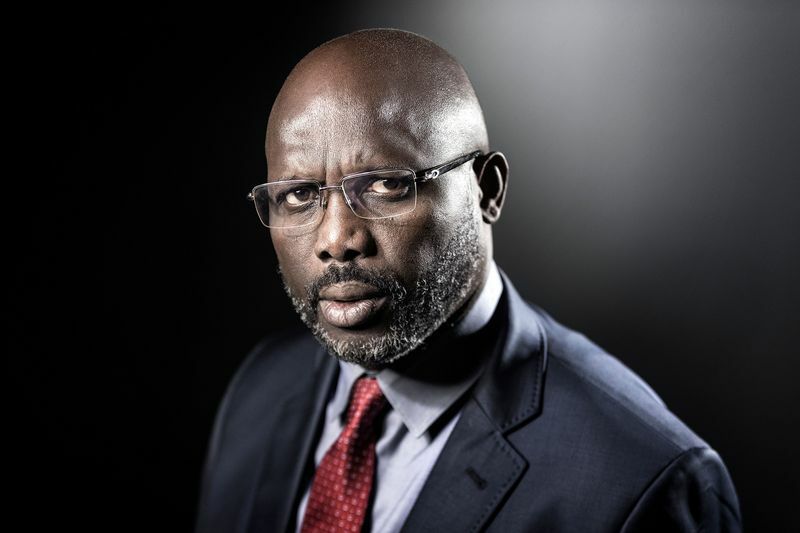 He lamented the incident of people who happen to be his associates, now turned as aliens because of the outcome of his defeat at the March 28th presidential election, urged them to remain in the party of to foster a stronger opposition that will regain its right of place in the nation seat , if members are committed to achieve the noble cause of virile government. He stated this while receiving the PDP campaign report from its Director General, Ahmadu Ali at the Presidential Villa, Abuja. Despite the loss of the party at the presidential election, the president said, PDP is the dominant party. According to him, PDP will remain strong in subsequent elections if members are committed and hard working. ours to the commemoration of the 2015 Workers Day, Labour leaders in Anambra State have lauded the governor of Anambra State, Chief Willie Obiano for taking the welfare of workers in the state to a new height and setting a precedent in government and labour relations. The Labour leaders who spoke in an exclusive interview in Awka to herald the May Day celebration were unanimous in their position that Governor Obiano had shown remarkable compassion in his relationship with the organized labour, paying attention to their sensibilities and listening to their needs. 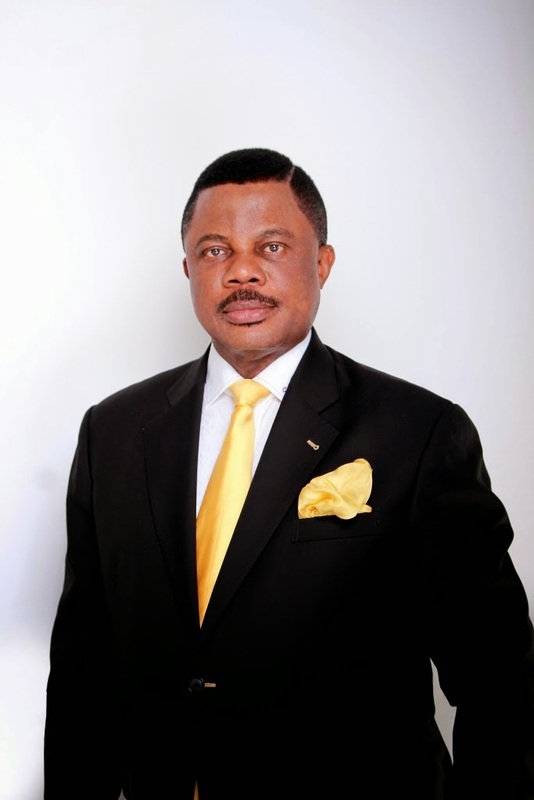 Describing Obiano as a “Labour-friendly Governor,” the newly elected Anambra State Chairman of NLC, Comrade Jerry Nnubia and the State Chairman of the TUC, Comrade Okechukwu Ifeanyi observed that the governor had shown extraordinary commitment towards the welfare and working conditions of workers in Anambra State. Our attention has been drawn for the umpteenth time to the attempts by internet scammers to fleece unsuspecting members of the public with a fake email account – obiaino@yahoo.com, pretending to be the governor of Anambra State, Chief Willie Obiano. We warn the general public to be wary of any unsolicited email with this fake address as it is not from the governor of Anambra State. Peeved by the killing of four of its natives, Nigeria has asked Indonesia to urgently return the bodies of the four executed Nigerians to their families for proper burial. Nigeria on Wednesday expressed “deep disappointment” at the execution by firing squad of its citizens for drugs offences in Indonesia and offered its condolences to the men’s families. The government said it was deeply disappointed over the execution of Messrs Martin Anderson, Okwudili Oyatanze, Jaminu Anashin and Sylvester Obiekwe by the government of Indonesia for drug related offences. “The Federal Government of Nigeria has received with deep disappointment news of the execution of four Nigerians, Messrs Martin Anderson, Okwudili Oyatanze, Jamiu Abashin and Sylvester Obiekwe by the government of Indonesia for drug-related offences,” the statement read. The four men were executed early Wednesday along with two convicts from Australia, one from Brazil and an Indonesian, despite repeated appeals for mercy from foreign governments and the men’s families. The Foreign Affairs Ministry made the formal request in a statement released in Abuja last night, expressing regret over the execution of the four Nigerians despite numerous pleas by President Goodluck Jonathan and other world leaders at several fora. Peoples Democratic Party (PDP) governors have teamed up with other stakeholders of the party to demand the sack of the party’s National Chairman, Alhaji Adamu Mu’azu, along with members of the National Working Committee (NWC). The governors, at a meeting on Tuesday night in Abuja, said Mu’azu and the NWC members, among others, were responsible for the PDP’s trouncing in the just-concluded general elections and must go to allow for the reorganisation of the party. The governor of Anambra State, Chief Willie Obiano has expanded the scope of his efforts to turn Anambra State into a model agricultural state, attracting $61m investments into commercial poultry farming in the state. Signing a Memorandum of Understanding (MoU) with Lynden Integrated Farms Limited in the Governor’s Lodge, Amawbia, Tuesday, for the establishment of a modern poultry production and processing farm in the state, Governor Obiano emphasized that Agriculture remains the number one pillar in his economic agenda. The Governor of Anambra State, Chief Willie Obiano has urged the three newly ordained Bishop of Church‎of Nigeria (Anglican Communion) to be shepherd of all Christians and not just those of the Anglican faithful in order to ensure salvation for all. The governor made the call while reiterating the prayers of Anointing by the Archbishop, Metropolitan and Primate of All Nigeria, The Most Rev Nicholas Okoh when he handed over Pastoral Staff to the new Bishops. The Consecration of the Bishops was held Sunday at the All Saints Cathedral Onitsha. President-Elect Muhammadu Buhari today called on members of the National Assembly to work with him in the task of addressing the development challenges that confront Nigeria. Outlining those areas of concern, he noted, first, that appropriate policies need to be put in place that may have to be translated into laws. The Anambra Chief Judge, Justice Peter Umeadi has advised 20 magistrates and a Deputy Chief Registrar (DCR) in the state to live above board in the discharge of their duties. Umeadi gave the advice on Monday while swearing-in the 20 new magistrates and a Deputy Chief Registrar in Awka. The 16 female and four male magistrates are Juliet Arinze, Moses Kanu, Obiamaka Ezebilo-Nnedu, Ijeoma Igbokwe, Chika Nwakamma, Catherine Chigbo, N.G.C. Maduakor, Nwadi Ani-Nnaka, Stella Ezeudeka and Moneke Onyekwuru. Others are Chidimma Nduka, Ebere Onunkwo, Chizoba Stanley-Udo, Martins Adumah, Peter Eke, Eyiuche Okosi, Uzoma Udeze, Rebeka Agwunobi, Nonye Anyaegbunam, Clara Ogugua and Mr Eugene Agbasionwe, a Deputy Chief Registrar. Umeadi noted that the task before them was enormous as a result of the just ended four months strike embarked upon by the state Judiciary Staff Union of Nigeria (JUSUN). 'You have come at a time when the state Judiciary is being repositioned. We therefore, ask for your best,' he said. The chief judge disclosed that more magistrates will be appointed soon as a bill which sought the appointment of revenue magistrates is passed by the state House of Assembly. He expressed hope that the process of selection of the magistrates will engender them to be the best in the country. Lizzy Gold Onuwaje isn’t new to the world of show business. Her foray into the make-believe world started in 2006, when she won the Delta State Pageant as Miss Delta State. Then she tried her hands at the Most Beautiful Girl in Nigeria Pageant (MDGN) where she emerged as the second runner-up. Like most of her peers who had the undying passion to get into acting, Lizzy had hers too, but it didn’t go well with her boyfriend at the time. President Goodluck Jonathan yesterday said he would be ready after leaving office for any probe of his administration’s activities. President-elect Muhammadu Buhari plans to revisit the $20b “missing” oil money when he gets into office. Besides, All Progressives Congress (APC) spokesman Lai Mohammed has alleged massive looting by government officials. But, in a statement by his Special Adviser on Media and Publicity, Dr. Reuben Abati, the President said he is not afraid of any investigation after leaving office. He noted that investigations will not be out of place since Jonathan’s Administration also reviewed the actions of previous governments on assumption of office. A day after the expiration of the three-day deadline given by Major Marketers Association of Nigeria, MOMAN, to stop lifting petroleum products due to debts owed them by the Federal Government, fuel scarcity has hit Lagos and environs. The crisis worsened as motorists spent an average of 12 hours at petrol stations in their quest to purchase the commodity. Also, majority of the fuel stations had altered their pump price, selling between N100 and N130 per litre. The prolonged scarcity had also brought in its wake, a hike in transport fares, prices of commodities and services both in Lagos and the Federal Capital Territory, FCT. In Oshodi, Ojuelegba and Ojota areas of Lagos, commuters were seen stranded, as there were few vehicles plying the roads. Sadly, the pictures here are our Nigerian brothers arrested at various times in Indonesia for drug trafficking .As we speak, 41 year old Okwudili Oyatanze (in Pix 1), 50 year old Jamiu Owolabi Abashin (in Pix 2), 47 year old Silvester Obiekwe Nwosile (in Pix 3) and 50 year old Martin Anderson may have been executed alongside 4 others (other nationals from Philippines and Brazil) . If so, may their souls rest in peace and may God comfort their families. My worry however is, knowing full well that Indonesia has a death penalty for drug trafficking and other related offences, why do people still traffic drugs into that country? I only hope more Nigerians (and others) in this evil business will learn from this and resist the temptation and desist. A word for the wise! In what may be the likeliest clue to the whereabouts of the Chibok girls, the Nigerian military have reportedly rescued about 300 men and women from the Sambisa forest, which is the known last enclave of Boko Haram terrorists. The PRNigeria broke the news on Monday night, saying that the Nigerian troops had in a daring and precise operation stormed the Sambisa Forest and rescued about 300 females. The news outlet gathered that at least three major terrorists' camps have been destroyed in the well-coordinated attacks that include the destruction of the notorious Tokumbere camp in the Sambisa Forest. Aliyu, who lost the bid to clinch the Niger East Senatorial seat, made this known in Minna on Monday while commissioning some projects constructed for the newly established Niger state University of Education and the Niger state College of Education, both in Minna. He however did not say in what role he will be coming back into the politics of the country in 2019 but he has been a serious advocate of a reorganization of the People’s Democratic Party, PDP, which suffered a serious defeat in the general elections held recently in the country. Aliyu has also been very vocal in asking his colleagues who lost in the election not to allow their defeat to make them jump ship to the new party that will be at the helms of affairs in the country on May 29. He spoke seriously against allowing the APC to turn Nigeria to a one party state which he argued will not be democratic and will also be against the political growth of the country. Confirming this on Sunday, Mr Emeka Ugwu, the Divisional Police Officer (DPO) in charge of Okpoko, said the gang was led by one Abuchi. Ugwu said the hoodlums met their waterloo following a tip-off by a public-spirited individual. He said that the police trailed members of the gang for over one week before they arrested them. He said one AK 47 rifle; wraps of cannabis and objects suspected to be charms, among others, were found in their possession. “Residents of Okpoko have heaved a sigh of relief since the arrest of the four-man armed robbery gang, led by one Abuchi. “This was made possible by information volunteered to us and we acted promptly,’’ he said. Even as the All Progressives Congress (APC) has promised to sustain certain agencies of government to keep up with development in Niger Delta, ex-militants from the region have cautioned the incoming administration of General Muhammadu Buhari not to tamper with the programmes of the outgoing Jonathan’s government. Speaking under the aegis of Niger Delta Salvation Front(NDSF), the ex-militants alleged that their kinsman and Peoples Democratic Party (PDP) presidential candidate, Dr Goodluck Jonathan, lost the election to international conspiracy and further accused the Chairman of the Independent National Electoral Commission (INEC), Prof Attahiru Jega, of playing a regional/ethnic card in the just-concluded general elections. “We are members of the Niger Delta Salvation Front(NDSF), a new grand coalition of ex-militants and agitators from all the Niger Delta states. “We have watched keenly the recent developments in the country- that is the general elections, especially the presidential election, and the hurried concession by our brother, President Goodluck Ebele Jonathan. One year after the abduction of Chibok girls, Nigerian troops, yesterday, stormed the Sambisa forest hideout of the Boko Haram terrorists, and rescued 200 girls and 93 women in a daring operation. “This is to inform you that our gallant troops have been making progress in the desired aim of ridding the nation of terrorists and their sanctuaries. “It is heartwarming to inform you that today (yesterday), troops continued the offensive and cleared four key terrorist camps in Sambisa forest, Borno State. So far, they have destroyed and cleared Sassa, Tokumbere and two other camps in the general area of Alafa, all within the Sambisa forest. Former Governor of Ekiti State, Dr. Kayode Fayemi said General Muhammadu Buhari (rtd. ), may consider granting amnesty to corrupt politicians who are ready to return stolen funds. Fayemi said this during a programme on BBC titled, HardTalk, which was monitored by our correspondent on Monday. After much persuasion from international communities to assuage death sentence issued on four Nigerians and other foreigners by Indonesian government to restrain action on executing the alleged drug traffickers, they they finally murdered the culprits. It was reported that the eight foreigners today who were charge for drug related offenses, including four Nigerians had group of death-row inmates was originally referred to as the “Bali 9” because of their prison and execution sentences tied to narcotics trafficking. The Philippine national, Mary Jane Veloso, was given a last minute reprieve of her execution sentence, largely attributed to the intervention by the President of the Philippines Benigno Aquino, according to reports. The four Nigerians executed today are Martin Anderson, Silvester Nwolise, Okwudili Oyatanze, and Raheem Agbaje Salami—all for drug trafficking. Martin Anderson and Raheem Agbaje Salami were mistaken for being Ghanaian and Spanish nationals respectively, because they travelled on false passports. One day after President Goodluck Jonathan authorized the release of a version of a forensic audit of $20 billion reportedly missing from Nigeria’s crude oil sales, an oil industry expert retained by Newsmen to look at the report has stated that the Nigerian government appeared to have pressured the auditors, PricewaterhouseCooper, to revise parts of its preliminary report. After analyzing the audit report, the expert concluded that the much-anticipated release of the audit report of Nigeria’s accounts and the Nigerian National Petroleum Corporation (NNPC) has provided few insights into the $20 billion that was allegedly not remitted to the Federal Accounts. The governor of Anambra State, Chief Willie Obiano is leaving no stone unturned in his commitment to establish cordial relationship with various religious denominations in the state, believing such bond will avail his administration the much-needed peace and spiritual backing to realize its lofty dreams for the state. Governor Obiano who spoke on Saturday at a dinner he organized for all Archbishops and Bishops of the Anglican Communion at the Banquet Hall of the Governor's Lodge, Amawbia, described the Church and government as partners in progress in the task of changing lives and building a virile society. The governor of Anambra State, Chief Willie Obiano has donated his salaries to the less privileged members of the society. Disclosing this in Awka at the weekend, Governor Obiano pointed out that he had sent a written instruction to his Principal Secretary, Mr. Willie Nwokoye to implement his wish with immediate effect. The governor’s directive followed his long practice of philanthropy and public spiritedness which had informed his earlier decision to donate his salaries to the churches since he took his oath of office on March 17, 2014.“I have been donating it to the church since I became a governor,” governor Obiano explained and further pointed out that he figured that giving it to the underprivileged people in the society through properly structured charity organizations would make for more impact. President Goodluck Jonathan, yesterday approved the appointment of the former governor of Anambra state, Peter Obi as Chairman of the Securities and Exchange Commission. But the appointment of Obi as SEC chairman was not politically motivated alone. Obi’s glittering career in the banking sector made him as easy choice for Jonathan. A business analyst told PM News that not many people know that Obi has a very rich background in business and banking, noting that, many associates him with politics alone. Born 19 July 1961 in Onitsha, Obi attended Christ the King College, Onitsha where he completed his secondary school education. He was admitted to the University of Nigeria, Nsukka in 1980, graduating with a B.A (Hons) in philosophy in 1984. This article titled Nigeria’s Next Leader’s Ties to a Heroin Ring by Daily Beast‘s Michael Weiss is bound to ruffle a few feathers. In the article, Weiss alleges that Bola Tinubu was involved in some heroin trafficking activities 20 years ago, and other fraudulent endeavors. General Muhammed Buhari’s political partner is a former bagman for two heroin traffickers. But that’s just business as usual in Nigeria. Nigeria’s election last month was celebrated as an unlikely victory for democracy in an African country with a tenuous record of free and fair representation. But the man most responsible for midwifing General Muhammed Buhari’s ballot triumph over current President Jonathan has a spotty CV. Leader of the now rested Niger Delta Volunteer force, Asari Dokubo has warned President-elect, Gen. Muhammadu Buhari against sending any ‘corrupt’ government official to prison. According to the ex-freedom fighter, if the incoming president ventures into sending anyone to prison, the ‘Moses’ in him will rise and the whole nation will boil. Dokubo who had earlier warned that if President Goodluck Jonathan loses second term bid, blood would flow in the nation warned the ex-general that he has no power to jail anyone even as the Commander-In-Chief Of the Armed Forces of the federal Republic. Security advisers of the President-Elect, Gen. Muhammadu Buhari on Monday barred the television crew of the African Independent Television from covering the activities of their principal until further notice. It was gathered that the security team cited adverse security reports and ethical issues as reasons for their action. Members of the AIT crew, who were at Defence House, venue of a meeting between the President-elect and a visiting Cuban delegation, led by its Ambassador to Nigeria, were asked to leave the vicinity until further notice. “Yes, we were told but we cannot just leave; we have a job to do. In any case, we have not been officially informed about what we have done wrong,” one of them said. Director of Press of the All Progressives Congress Presidential Campaign Organisation, Mallam Garba Shehu, confirmed the development. He said concerns over security and the need to sort out some ethical issues were responsible for the action. 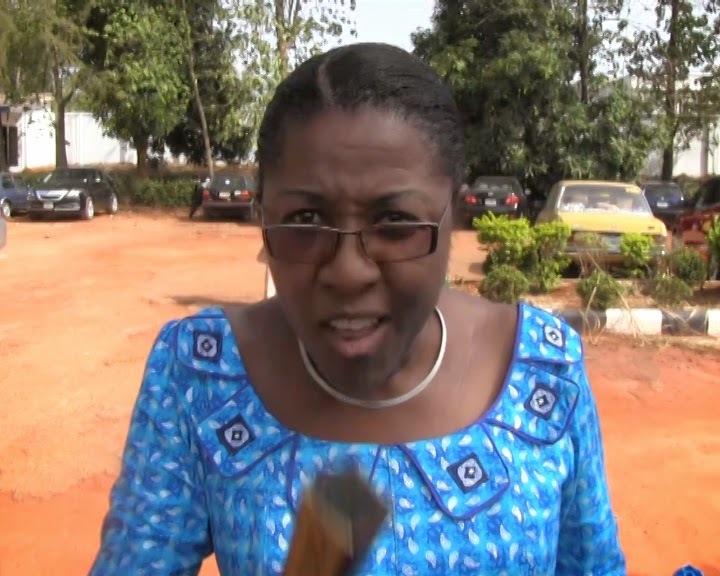 The immediate past Special Adviser to the Anambra state governor on Millennium Development Goals (MDGs), Barister Vivian Nwandu has debunked the rumour that surrounded her resignation from Governor Willie Obiano's cabinet, attributed it to strictly health challenge. She disclosed that she had been out of the country on a medical treatment,for several months, not minding what people rumored about her resignation..
Barrister Nwandu, who finally decided to break out of her silences to journalists in Awka, after witnessing the swearing in of the twenty newly appointed magistrates by the state chief judge, Justice Peter Umeadi. She distanced herself from the rumour making rounds that she was frustrated by the governor, on the allegation that she was an off-shoot of the erstwhile governor, Mr. Peter Obi who may still command her loyalty against the interest of the incumbent administration.